Did you know we sell more than just bingo supplies? We stock a wide range of club and fund raising supplies for all your needs, including raffle tickets and drums, perfect for holding your own fundraising event. We sell raffle ticket books in bulk quantities starting from just £10, numbered 1-1000, in packets of 10 or 40 depending on your requirements. Printed on quality paper perforated for easy distribution, they are security coded to prevent fraud. 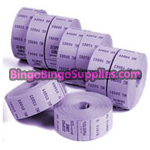 We also stock 5 to view spinner tickets in pads and rolls, in units of 100,000 at wholesale prices. In addition to tickets, we sell high quality raffle and tombola drums in various sizes at competitive prices, making us your one stop shop for all the fundraising and raffle supplies you need. 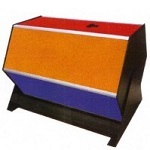 Our raffle ticket drums are made from durable material and are suitable for larger public events such as school fetes and or holiday camp competitions. What are raffle tickets and where can I buy them? 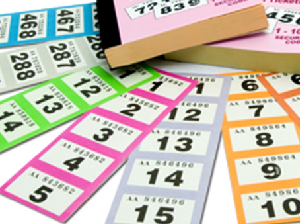 Raffle tickets are numbered pieces of paper used for raffle or tombola draws. They are usually sold at fundraising events, with the aim of winning a prize if the holder’s number is picked from a box or drum. We sell raffle products including tickets and drums at competitive wholesale prices, perfect for both personal and professional public use. You can see prices of some of our popular raffle supplies below, if you can’t find what you are looking for feel free to contact us.